Overnight relief. Bisacodyl. Effective short-term relief from occasional constipation. Relief in 6-12 hrs. For the short-term relief from occasional constipation. 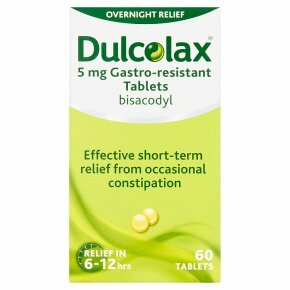 Dulcolax® Tablets have a special coating that helps ensure the medicine works only where needed. Laxatives do not effect the number of calories absorbed from food. This means they do not help with weight loss. For oral administration. Dosage: Adults and children over 10 years: Take one or two tablets daily before bedtime, or as directed by your doctor. If you have not taken Dulcolax® before, start with one tablet and increase to two if necessary. Swallow tablet whole, with water. Children under 10 years: consult your doctor. Please see the enclosed leaflet for further information.